Kyoto is one of my favorite places in the world. Built in a basin that’s surrounded by mountains, the city is influenced by every season. Everything bursts into life in spring, summer is hot and sticky, autumn is a riot of gold and red maple leaves, and winter brings snow and serenity. You can find Buddhist temples nestled within the mountains, meticulously maintained gardens (of the sand, rock, and traditional Japanese variety), funky cafés and restaurants, and countless spots to relax and soak it all in. Duck into a tiny alley and you may find a maiko (trainee geisha) delicately balanced on her geta (platform sandals) or a weeping willow swaying over a moonlit stream… or a band of drunken students shouting and singing. The city is full of surprises! 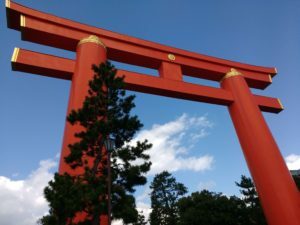 There are countless things to see and do in Kyoto, but here are my top recommendations for how to spend your time there. One piece of advice: There are so many amazing temples and shrines in Kyoto that it can feel really intimidating. Don’t try to see them all. I suggest choosing a few that really interest you and focusing on those. I think visiting one temple or shrine a day is a reasonable goal. Too many more than that and they’ll all start to blend together. 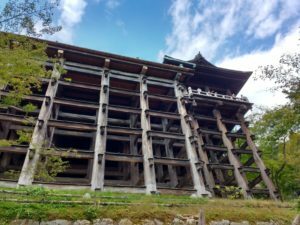 Here is a brief guide to some of my favorite temples, as well as a few other things to do in Kyoto. Kiyomizudera: Part of the fun is getting here. You can spend a long time wandering around and exploring the shops and restaurants on Ninenzaka and Sannenzaka that lead up to the temple. What makes Kiyomizudera so notable is its location—it’s built right along a ravine, so you get dramatic views throughout your visit. There’s also a nighttime light-up here in autumn and spring (usually late October to late November and mid-March to mid-April). The view of Kiyomizu looking up from the ravine. Speaking of light-ups, they don’t just happen at Kiyomizudera. Several other temples, like Kodaiji and Shoren-in, offer them as well. The light-ups usually coincide with autumn leaves and cherry blossoms, so if you’re visiting Kyoto in October/November or March/April, check in with the tourist office in Kyoto station to find out which temples are having them. I cannot recommend this enough—it’s seriously one of the most breathtaking experiences you can have in Kyoto, and that’s saying a lot! Heian Jingu shrine and garden: Heian Shrine is one of the most impressive landmarks of Kyoto. It’s hard to miss the giant orange gates that take up a city block. Like most other shrines, you can do fortune telling (omikuji) and buy good luck amulets (omamori), but for me the real treasure at Heian Shrine is the garden in the back. It costs about ¥600 (roughly $6) to enter but it’s definitely worth it. Any Harry Potter fans out there remember the scene where they step into a seemingly normal-sized tent which ends up being palatial on the inside? That’s what stepping into this garden always feels like to me. There’s koi-filled streams, hungry turtles and ducks who’ll swim right up and unapologetically steal the food that’s intended for the fish, and depending on the season, weeping cherry blossoms, a riot of pink and white water lilies, or pretty purple irises. The impressive torii gates marking the entrance to Heian Shrine. Koryuji: This temple is usually not quite as slammed as the others, which makes it a nice, peaceful place to wander around. There’s a beautiful wooden sculpture of a seated Buddha which is a Natural Treasure. Kurama onsen: If you visit in autumn or winter (or maybe during a cold snap in spring), take the Eizan line from Demachiyanagi station up to Kurama and visit the hot spring there. You don’t have to stay overnight—you can get a day pass to spend a few hours soaking in the outdoor tub while taking in the fresh mountain air. Very refreshing! Most people who are in the areas for a few days go to Nara to see the deer and the Daibutsu (giant Buddha), and that’s a fun day trip that’s definitely worthwhile. I also really love the day trip to Uji. If you take the Keihan line, you might score a seat on the upper level of a double-decker train and take in some great views along the way. Byodoin temple is amazing and there’s a really modern museum inside that I think is just incredible. Uji is famous for green tea, so definitely try some and get some green tea sweets (ice cream, confectionery, etc.). 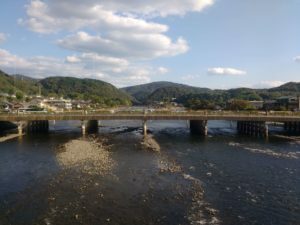 The view of Uji river from the Keihan line train. Kyoto has a ton of flea markets and they’re always a great spot to score vintage kimono and other assorted handmade goods. Most flea markets take place on specific dates (e.g. the 25th), so it’s always a good idea to check in with the Kyoto tourist office to see if any will be happening during your visit. There’s something for all budgets and tastebuds, whether you’re looking for the exquisite or the everyday. Here are just a few of my favorite spots. Ajiro is a shojin ryori (Buddhist vegetarian) restaurant where you get your own private room and a series of immaculately presented courses. Depending on which course you get, you can make your own yuba (a delicate layer that forms on top of soymilk). 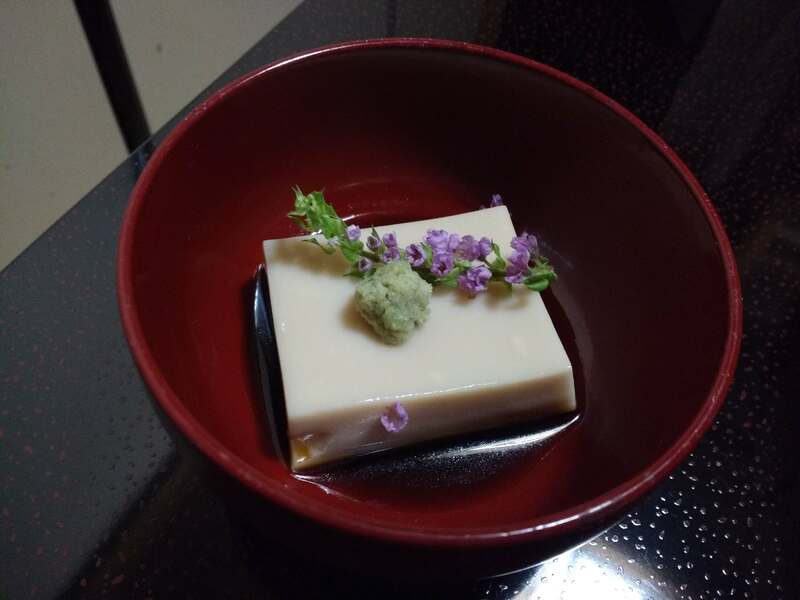 Gomadofu (sesame tofu) with edible flowers and wasabi at Ajiro. If you’re interested in trying this cuisine but want to do it in a slightly less buttoned up atmosphere, you can visit Shigetsu at Tenryuji temple in Arashiyama and do their lunch special. efish café has great views of the river and yummy food as well as funky gifts for sale. Ace Café is one of my favorite places for an afternoon coffee or an evening drink. It’s on the 10th floor, so you get views of the river and the whole city. Falafel Garden in case you tire of Japanese cuisine and want something different. Do you have any favorite Kyoto spots that you’d add to the list? I’d love to hear about them!